In Week 7 artist Maggie Roberts aka Mer came in to talk about her work which is based on science fiction and audio visual. She looks at the organic and non organic sympoetic evolution, hyperobjects, Machine Vision,virtual textures, frequencies and digital uncertainty. Her interests are the invisible currents and currencies affecting the visible for example geological time scales, Shamanic animal becomings ,communication currents evolving , hyperobjects linked with climate change. Hyperobjects ( it is objects that are massively distributed in time and space relative to humans and we cant touch or see them). “Hyperstition is a positive feedback circuit including culture as a component. It can be defined as the experimental (techno-)science of self-fulfilling prophecies. Superstitions are merely false beliefs, but hyperstitions – by their very existence as ideas – function causally to bring about their own reality. Capitalist economics is extremely sensitive to hyperstition, where confidence acts as an effective tonic, and inversely. The (fictional) idea of Cyberspace contributed to the influx of investment that rapidly converted it into a technosocial reality.” Her work is based on science and fantastical fiction,organic and non organic sympoetic evolution, hyperobjects, Machine Vision,virtual textures, frequencies and digital uncertainty. Her interests are the invisible currents and currencies affecting the visible for example geological time scales, Shamanic animal becomings ,communication currents evolving , hyperobjects and climate change. Her work uses digital formats of media, photoshop,video,animation and LIDAR(laser light).These mediums are fused with paints,oil paints,collage,photography, watercolour and other sheen mediums,creating intricate remix process which is applied onto surfaces such as paper,canvas and video screens. She has also had technical specialization in areas such as camera work,editing/effects,prosthetic and costume design and voice/text work.She has researched myth, archetype and trance possession in Haiti, South Africa and Mexico. She has series of works under the collection name Image Hybrids,which sound interesting, she creates collages an digitalised them with her drawings and paintings in an abstract way.I could possibly use this inspiring technique of combining such mediums together for future projects. This artwork is under the series called ‘Connections to an untethered future’, the word ‘untethered’ means: to release something from a tether, possibly release an animal(horse) that has been tied or chained or to unconnect, so it could mean in other words, the connection to an unconnected future possibly something related to technology or the internet. I find the use of mixed digital media combined with paintings,photography interesting and aesthetically pleasing furthermore the way she presents her work to reinforce her ideas about the world,nature,people and fantastical ideas.Some of her works I can see a mixture of nature,space,land,sea creatures and other animals which are collaged and photoshopped digitally in a utopia style. Some of the colours in her work are soft, possibly the use of watercolours and others are harsh as they are digitalised. One of her recent works which is a colloboration with Ranu Mukhurjee artist, together are called ‘Orphan Drift‘ which has been ongoing since 2015. One of their works called GIR is a project that reimagines the urban as porous, interspecies and terraformed both ancient and impossible. London based artist, Simon bill, his work focuses on how we perceive and its connection with the brain can create our vision on seeing things differently. During his talk Bill didnt show any of his work nstead talked about his interests about scientific studies of the brain and philosophy and optical illusions. 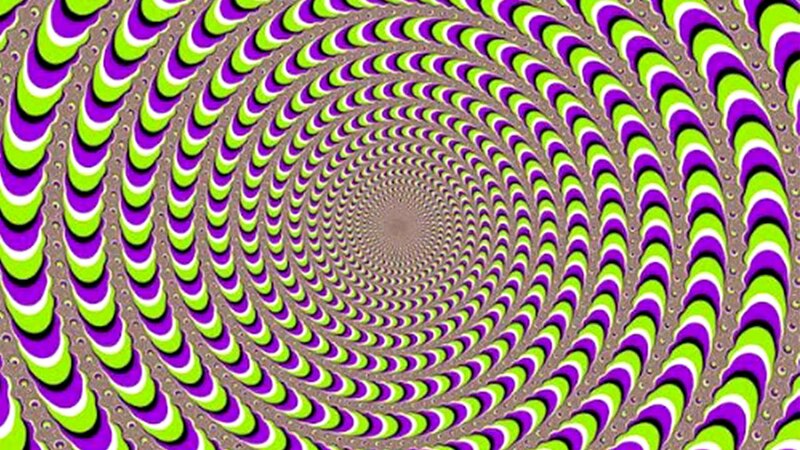 He showed some examples of optical illusions and why our brain sees them in different ways and the way they are. Visual perception- the quality of being aware of things through the physical senses,especially sight. colour wheels,spinning, colour theory first ever made by Newton, the wheel appears white when it is spun fast, this shows how the white light was the compound of the primary colours. there are two sides of visual perception, science and art, also how it crosses over. there are two approaches of perception, neuroscience and philosophy. Filling in, which is a grid and is surrounded with other dots and can see he focus but other dots are spaced out cant see those around it. For example the duck and rabbit illusion, I can see a duck and then I notice a rabbit. However you can never see them both at the same times.Perception can rely on several factors for example, proximity,similarity, continuity, closure, figure and pragnanz(from gestalt psychology. Our perception tries to find something familiar from the image and so we link what we are looking at to a previous experience to make sense of it all. Simon Bill, The two cultures, where are we now? Critical theory- can be found within other academic subjects in arts&humanities for example geography, economics and history. Thomas Kuhns- the idea that scientific knowledge is a kind of myth.